> Schumacher: a Danger or a Legend? Schumacher: a Danger or a Legend? There is little doubt in my mind that Formula One has changed a lot in the past 15-20 years. The heroes of the 90’s; Prost, Senna, Mansell were replaced by the likes of Schumacher, Schumacher and Schumacher come the 2000’s – alright, it wasn’t all about Schumacher I’ll admit, the names that stand out of course are Villeneuve, Hill, Hakkinen, Montoya, Alonso, Raikkonen but all of these drivers rather disprove my point (with the possible exception of Montoya), so I’ll conveniently forget about them for the moment. Back in the 90’s Formula One was all about out right grit and wheel to wheel racing in what has became known as the “Prost and Senna” era. Last week popular British BBC show “Top Gear” they showed an item on Ayrton Senna and brought in commentator and long time racer/rival Martin Brundle for some analysis on Senna’s driving style. Brundle commented that Ayrton had a ruthless quality to his driving and would (and I quote), “position his car in a way that meant you either let him past or you’d have an accident. And he would leave it up to you decide whether to have an accident or not”. He also added “once you’d let him past of course, he knew that he’d get away with that every single time”. So Ayrton Senna, the greatest driver who ever lived, was a ruthless racer who would push and fight for every inch of the track and strive to win at any costs. He really was a magical driver and ultimately focused on achieving nothing but a win; “I’m not designed to finish 2nd or 3rd, I’m designed to win”. Come 1992 a young German pretender entered Formula One; a man named Michael Schumacher. Senna was his idol (as every driver’s idol is Ayrton), and he had the chance to race against him for two years, sometimes even racing and fighting for track position against one another and this was certainly the case come 1994, before Senna’s fatal accident and Formula One changed forever. A raft of regulation changes were introduced for 1995, track layout changes were made to slow the cars down and safety procedures and equipment were introduced and made mandatory – all for the safety of the drivers. In my opinion, these changes could only be considered positive, especially when you look back at some of the accidents that have occurred in Formula One since and we’ve watched drivers walk away from them unharmed. But I’m getting off track here. Schumacher was brought into F1 under a generation of racers who were taught to fight for every inch of track and to be tough and ruthless in achieving their targets and ambitions – and Schumacher has carried this mentality with him throughout his career, which as we all know has won him a legendary seven World Drivers Championships before his departure from F1 in 2006. Between 1995 and 2009 not only have the rules changed and safety brought front and centre, but the driving etiquette and style has changed to reflect a more precision racing craft, the banging of wheel to wheel racing has over time been replaced by a more tactical and controlled method of racing where drivers are taught to know when to push and when to sit back and think through an overtake manoeuvre or concede another driver getting past if their nose is ahead moving into the next corner (the only driver who I can remember who didn’t race to these rules in recent memory is Juan Pablo Montoya who’s aggressive style earned him a reputation as a wild driver). As new drivers who have entered the sport have adapted to this way of racing, perhaps only Schumacher from the 90’s era of driving has not changed his approach. The only other drivers from this era who are still around today are Rubens Barrichello and David Coulthard, but neither of these drivers have ever been accused of being ruthless racers at any point in their careers and it is perhaps for this reason why they have never been able to achieve the same success as Schumacher – a ruthless streak was required without doubt. But Formula One has changed again between 2007 and 2009 whilst Schumacher has been away, dangerous manoeuvres no longer have a place in the sport and the business side of the event has taken over – teams would rather have their cars finish the race and have their sponsors shown off generating revenue than race with another car and end up off the road. Think about it, 2007 Kimi Raikkonen quietly won the championship without running anyone off the road or fighting hard for every overtake, Lewis Hamilton never went wheel-to-wheel and pushed and scrapped with Massa in 2008 and Jenson Button’s Championship in 2009 was fairly won by driving intelligently. Schumacher’s return this year brought back some of that raw fight from the 90’s back into the sport – and the young drivers now in the sport are no longer afraid of the legend in the same way that Schumacher was never afraid to race the great Ayrton Senna. Schumacher’s Mercedes this year is viewed as a trophy prize for any new young driver in the fact that if they are able to overtake him, it somehow makes their value increase – who wouldn’t want to claim that they can race and pass a seven times World Champion legend? The problem is that as a legend Schumacher cannot afford to look weak against these competitors, especially if he is serious about mounting bids for the World Championship over the next couple of years. 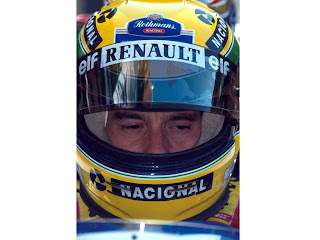 As Senna discovered, once he’s gained that psychological advantage over his competitors, he could exploit it every time. Which brings us to Sunday’s race and the challenge between Schumacher and former team mate Rubens Barrichello at end of the Hungarian Grand Prix? Lets face it, both of these drivers have vast amounts of experience to draw upon and both drivers know how each other operate inside a racing car and both know that there is a perceived ‘bad blood’ between them after their time together and Ruben’s outspokenness over his former Ferrari team mate. The incident occurred at the end of one lap, leading into a new lap. Barrichello on newer, fresher tyres held the advantage as he closed in on the back of Schumacher’s Merc at a vast rate of knots, Schumacher’s car faulted coming out of the last corner onto the pit straight and looking at the footage you can clearly see Schumacher moving towards the right hand side of the pit straight. Barrichello in his slipstream clearly sticks with him and jolts to the right to overtake. From the camera looking down the pit lane, you can clearly see Schumacher’s head pointing towards his right-hand mirror watching for Barrichello’s move, which he is anticipating will be on his left, where all of the available track now is – Barrichello fails to recognise this and proceeds to push his way past on the right hand side of Schumacher’s car. Schumacher then appears to squeeze Barrichello against the concrete pit wall – Ruben’s Williams finds just enough space to get through and make the overtaking move stick. As soon as Schumacher realises what is happening, his car moves to the left to both avoid contact and to be ready for the next right hand corner which is fast approaching. What is clear to me that although the squeeze towards the pit wall looked dramatic from the onboard camera of Barrichello’s car, Schumacher who had been looking in his mirrors all the way down the pit lane has carefully left just enough room for a Williams to get past if the driver continues to make the overtake down the right hand side rather than opt for the overtake on the left. The move by Schumacher was tough and it was ruthless and it was exactly the kind of move that I would expect from him – a defensive driving move straight from the Senna book of driving; either back off or you have the accident, you decide. The difference being F1 has moved on and will no longer tolerate such driving actions. A ten place grid drop has been imposed on Schumacher for the next race as result and it sets a dangerous precedent in a sport that is desperately trying to bring back some of that close wheel-to-wheel racing that has been lost in this latest generation of drivers. And once again, Schumacher has been labelled as the bad guy and a dangerous driver. Trust me; if I were racing in Formula One, Schumacher is one of only a few drivers I would ever place my faith in to leave enough room to complete that overtake, then again, I’d have overtaken on the left. Could you Quit the 'Big Three' in Internet?